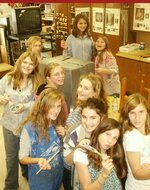 The Art Club exists to provide opportunities for students in grades 7-12 to participate in art projects and activities that are not necessarily available to them during normal class time. Art Club activities are usually student driven, in that students tell the teacher (Mr. Yolen) what materials or artforms they are interested in. Mr. Yolen then facilitates their explorations. Activities may also include short, local field trips to galleries and artists' studios, as well as more ambitious field trips to museums. Students will be responsible for all expenses and admissions fees. Activities may also involve creating theater sets for the Drama Club production.